If you hire people to work in your business then you’ll know how expensive it can get – not only on their wage but also on holidays, in-work perks, ongoing training and development, and bonuses. That’s once they’re on board; getting good staff to join your company can also prove to be a costly exercise. But that’s not to say it’s not worth it because hiring on the cheap could impact negatively on both your company’s future productivity and its profitability. Good recruitment gets the right people in the right place to make the right impact on your company. Get the wrong person in place and it can have a worse impact than hiring no-one at all. It’s important that you get it right as making a good hire can take your company to new places and have a positive impact on staff morale, and on your company’s bottom-line. Each option comes with pros and cons. Hiring a specialist recruiter seems like the most expensive option. It probably is, but it means you’ll save yourself a whole heap of time. A specialist recruiter will have access to skilled industry professionals and experience in hiring people for the type of role you’re looking to fill. They will likely have a database of professionals looking for work that they can tap into. Hiring a recruiter can mean that you don’t have to publicise that you’re looking for a new team member. This is important if you want to keep it secret that someone high profile is leaving, or for any other reason. You must still take some time when hiring your recruiter – get to know them and how they work. Give them the information that they need to do the best job possible for you. But leave them to their work and trust them to do the job you’re paying them for. Hopefully, the end result is that your vacancy is filled by a passionate and competent professional who fits right in with your company culture and will stay with your company for as long as possible, even if the fees make your eyes water a little. If you do a lot of hiring then you may have access to an in-house HR department. The main advantage of having your own HR department is that they should know your business and what it is looking for inside out. They have vast experience in not only hiring for your industry but hiring for your exact business. They have an unparalleled insight into not only why people come to work for you, but also why people leave. The biggest disadvantage to your own HR team is the ongoing expense, particularly where hiring is sporadic. Another disadvantage is that the team can get stale over time. It’s a good idea to get a fresh perspective on hiring every now and again, and an HR department that’s been in place a long time may not be the freshest minds in the business. It’s up to you to make sure that your HR team have the training they need to do their job as much as the rest of your staff. You could take it on yourself to do your own hiring. This is the option that will probably be the most time-consuming to you personally but is the one most likely to produce the exact candidate that you want in the role, although this isn’t necessarily a good thing; we humans have many cognitive biases which means we often make subjective decisions that are not necessarily optimal. While advertising the role yourself, reading through all the applications, shortlisting, and carrying out interviews can work out a lot cheaper, you do need to take care that you’re not inadvertently breaking laws on hiring. See Recruitment and discrimination for more information on this, particularly for interviews, which can be a minefield. Saying that, if you’re really keen on getting someone who not only can do the job but who gets along with you, then selecting them yourself can have advantages. Developments in technology mean it’s easier than ever before to find low-cost alternatives for your recruitment, reducing your business costs. For example, Jobshakers allows current employees to recommend their friends for jobs at their workplace. Employee referrals are a good idea anyway as it means you could be taking on someone who already has a good idea of what you do, and the employee referring them suspects their friend could be a good fit for the role. An app is simply an extension of what is already a fairly common practice. You can also use technology to help with on-boarding a member of staff. The hiring period is risky as you can potentially lose a new employee to a rival firm, and the longer your on-boarding process drags on, the larger the window of opportunity for a rival firm to poach your new hire. Hiring is time-consuming and costly, and almost all of this budget is used before your flashy new hire even starts working for you. If technology can speed this process up, and make your new employee less likely to leave you for your competitor, then all the better! LinkedIn is a fantastic resource for finding your next employee. To get a vacancy in LinkedIn’s job section and get it under the nose of industry specialists in your region, you need to pay, but there’s nothing to stop you sharing it for free on your own LinkedIn company page, although this means it will only get seen by those who already follow you and selected connections of those who share it wider. If you want to spread your reach further to those who don’t follow you, or even may not have heard of you, then the official LinkedIn jobs feed is good value. Facebook has announced it is working on a way of letting users apply for jobs through their site. This is a huge development as Facebook is often seen as totally separate to the more professional LinkedIn, and there are concerns about employers snooping on a potential employee’s private profile and seeing what they are sharing. But here’s some news – recruiters can do that now anyway depending on the employee’s privacy settings. Facebook applications can certainly help reduce your recruitment costs, although we suspect that they will make a charge to employers for this facility in much the same way as LinkedIn. 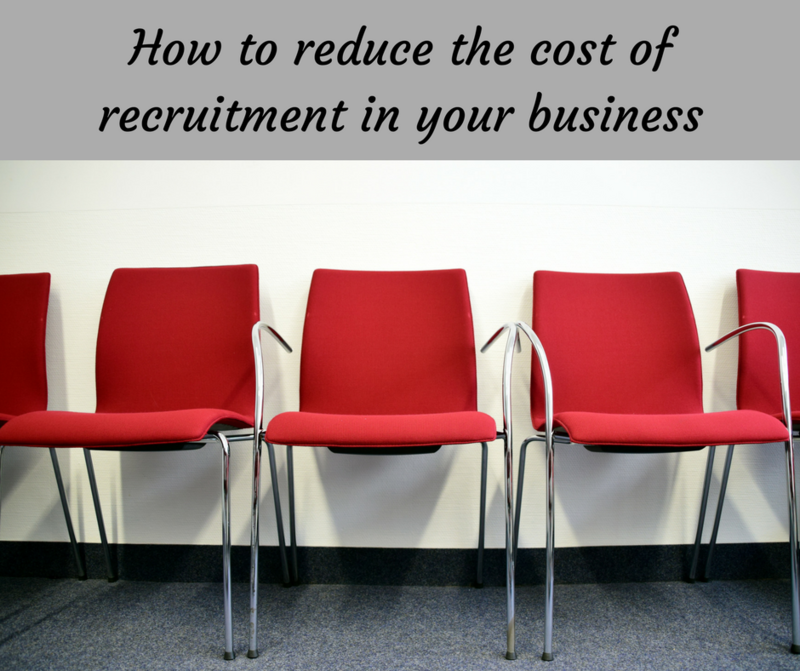 Of course, the best way to reduce the amount you need to spend on recruitment is to decrease the number of vacancies. Encouraging good staff to stay with you for longer means you have to work less hard on finding people to fill the gaps. A good company culture with training and development opportunities and competitive pay and perks will keep good people for longer. While offering above-average pay and forking out for training programmes may feel expensive at the time, it could get a whole lot more expensive if you try and keep costs too trim. Finding it difficult to recruit staff for skilled roles? Have a read of our article about filling the skills gap in your business.